There is 1 shop proposing this game for download at an average price of $ 1.95. Hearts is a digitization of the classic game of Hearts, the card game, a parlor/social game. It's designed relatively primitively, yet, by no means, it is not a badly produced game. It just will need to be approached with very low expectation from the graphics, and if that's your mind set, it will offer you loads of fun. Also, another cool thing that the game does is offer you different version of Hearts, but they are all neatly explained. You can play the game in single player, and you can also play it in multiplayer, in hot seat mode. So, all in all, Hearts is a cool, well done game, has an interesting construction, looks primitive, within limits, yet offers you all you need to keep playing, and thus, is a great game in any retro gamers' collection. Another well done game, similarly old, and also card based, is Bridge Master, which will offer you a satisfying and well done construction and production. 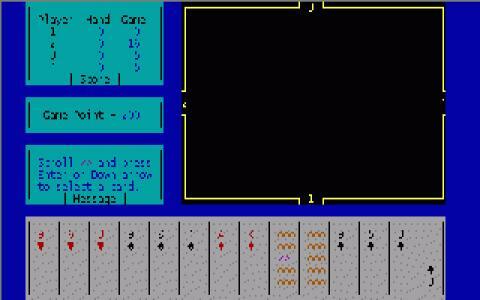 SO, for your card game collection for DOS, have them both downloaded. They won't disappoint if you're into retro games.